Adaptér pro vzdálenou správu ethernetových zařízení po internetu (VPN). 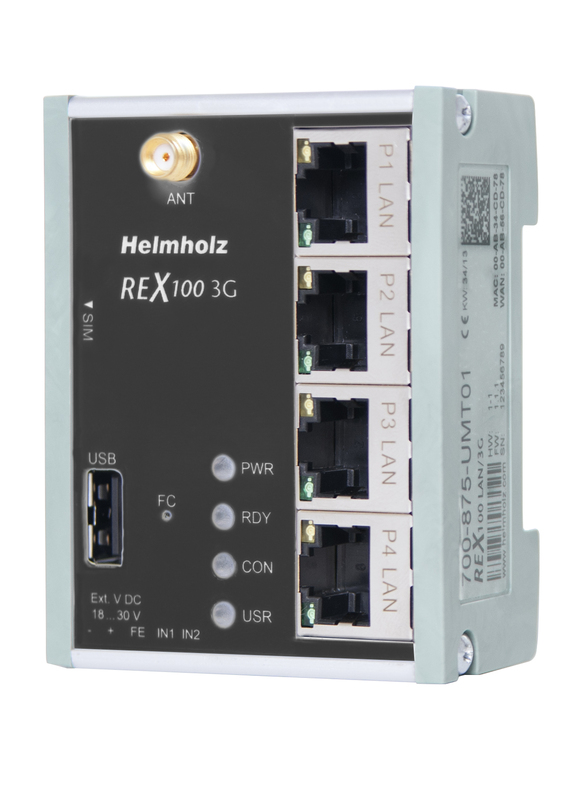 The new REX 100 industrial routers have a compact design: Not even as big as the palm of your hand, the devices can be snapped into the control cabinet on any standard DIN rail. Nevertheless, they offer all the features you expect from a state-of-the-art remote maintenance solution.Regardless of the manufacturer, Ethernet participants such as PLCs can be reached with the REX 100. All programming and remote maintenance is carried out on the portal. Data transmission is via encrypted VPN tunnel on the basis of the secure OpenVPN protocol. In addition, the new routers have digital inputs: One serves as the trigger for establishing the connection to the portal server. Another input can be assigned to a function for issuing alarms. In this way, appropriately equipped REX-100 routers can send alarm SMS and e-mails. The data packets are directly forwarded to the automation network. Another new feature is what is known as shSMS wake-up. This triggering function makes it unnecessary to send an SMS text message or press the “DIAL OUT” button to initiate the connection to myREX24 with cellular network routers. The SMS text message is instead sent to the defined cellular network number autonomously by the myREX24 portal using shSMS. Then the previously selected REX router connects with the myREX24 portal. This allows the online times of the routers to be reduced, along with the transmission costs. a) The configuration file is saved and then transferred to the REX 100 using a USB stick. b) The configuration is downloaded from the myREX24 portal using the REX 100 router’s Internet connection (Configuration Transfer Manager = CTM). c) The configuration is transferred to the REX 100 on the local LAN connection of the PC on which shDIALUP is running. The prepaid card REX Global SIM is specially designed for teleservice and M2M applications. It is used for global connectivity of the REX industrial router to the VPN portal myREX24 – for data capture, visualization, alerting, teleservice, or direct M2M communications.